One of the fundamental things young children learn in preschool is how to play with others. They will be doing it their whole lives. It’s never too early to learn. When sharing space, toys, tools and attention with other kids, conflict is going to happen. The first thing many parents and teachers want to do when yelling, pushing or kicking starts is to rush in break it up. Yet every squabble is a learning opportunity. The children in the middle of it and on the outside can use this experience to settle future conflicts. As teachers and parents, we can give them the tools to do so. Adults are fond of saying “use your words" when fighting, screaming and crying breaks out. It is great advice, but preschoolers don’t come pre-loaded with those words. We need to teach them. The children in a preschool class are making a huge transition. Only a short time ago, they were toddlers at the center of their universe. Maybe they have older or younger siblings, but they still occupy their own two- to three-year-old niche in the ecosystem. Suddenly, they are surrounded by a dozen or more kids their own age and size. They’re expected to coexist, share resources and find an identity in this new world. Don’t be surprised if it doesn’t happen on the first day. What do you do when someone hurts you? What if you want something someone else has? What if they take something from you? How do you handle all the giant emotions you feel? These are the questions preschoolers need to answer for themselves with our help. It starts with labeling feelings. Find picture books on the topic and read to the kids about the range of human feeling. Have them show you an angry face and a sad face. Enable them to describe what’s going on inside. Then acknowledge that everyone has feelings. It is natural sometimes to be jealous, happy, disappointed or nervous. Use examples from your own life and tell them how you reacted to the emotion. Show them the right and wrong way to respond. “I was angry because I was running late and another driver cut me off. I wanted to honk my horn and throw something out my window. Instead, I took a deep breath and realized I was tense because I was in a hurry. Getting mad would not get me to school faster. I put a mellow song on the radio and thought about your smiling faces." 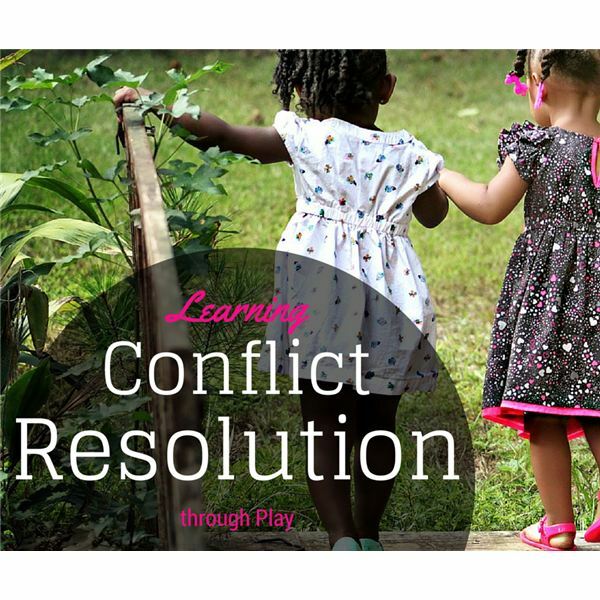 We need to anticipate potential conflicts in the classroom and on the playground. Children may not respect each other’s space while waiting in line. Someone will want to push his or her way to the front of the line. Kids may crash into each other by accident. Two kids will want the same toy. Before these situations occur, your students can practice the right thing to do. Bring two children to the front of the class and propose a scenario. While drawing, both students reach for the same color marker. What emotions may come out? One child may be jealous because the other one gets to make purple stars. One may be angry because the other pulled the marker out of his hand. One may be frustrated because she thinks she never gets what she wants. Now ask them how to deal with this situation. They should talk it out and notice that each one wants the same thing. They can decide to take turns. Flip a coin or play rock/scissors/paper to decide who goes first. A potential fight just became a game. They can ask around to see if another table has a purple marker they are not using. One can see this as an opportunity to take their artwork in another direction. Without a purple marker, maybe it would look better in blue or green. Try this with any situation around the preschool environment that could be a cause for conflict. Try it with problems your class had in the past. Practice how to do it better next time. No matter how well you prepare them, problems will occur with your students. Think about a fair and consistent method for reaction when kids run up to you crying and pointing fingers. Remain calm. Get down to eye level with the children. Speak slowly and steadily. Show that you understand. Tell them what you observe. “I see you’re angry." “You look frustrated." Ask questions. Inquire about the conflict and listen earnestly to their responses. Hear both sides. Repeat what you know. Clearly retell what you learned about the situation. Children get upset when they feel no one understands them. Ask for their input. How do they think the problem should be solved? Make them part of the solution. Praise and reinforce. Thank them for being able to identify their feelings. Let them know you are proud of them for working out the conflict. Observe from a distance. Keep an eye on the children to see that they are sticking to the truce. Watch for any flare-ups and praise them again when they play in peace. Every family, office, school, party and social group is just a big playground. We need to learn the rules and play fair. We need to share, not bully each other and clearly communicate our feelings. From our first day to our last, the players and field change but the game stays the same. By understanding that preschoolers are not born knowing how to play tag, anticipating potential conflicts, rehearsing resolutions and congratulating them on every little success, we can turn these rascals into brilliant adults who work well together.